When it comes to the home buying process, it’s typically best to approach things in phases – especially if you’re a first-time homebuyer or if it’s been awhile since you last purchased a home. According to National Association of Realtors, first-time home buyers made up 35 percent of all home buyers in 2016. This article is a (re)introduction into that of home inspections. So, what is a home inspection? Unlike that of a real estate appraisal or comparative market analysis (CMA), home inspections are practical, in that they are a thorough evaluation of the state of the house you are purchasing. Your home inspector will be looking at the “bones” of the property. These include, but are not limited to, the foundation, roof, basement, electrical panel & every electrical socket, plumbing, heating and air conditioning systems, and in most cases, even the appliances. In short, it’s an overall look into what might be wrong with the property. Realtor Magazine, a source that keeps real estate brokers up to speed on trends to be aware of when working with home buyers and sellers, recommends a list of items that should always be examined in a home inspection. See the full list here or download Nancy Miller’s quick sheet! These are things that can be expected to occur over time in an existing home. Examples include: wear patterns in the carpeting, nicked or scratched paint, dull shine on countertops, settling cracks in drywall or foundation walls. Some inspectors will go the extra mile to explain everything to you, but a general rule of thumb is that if the item is still fulfilling its purpose, no matter how old or dated an item might be, it is passable. These are items where there is an obvious repair that needs to be done, but it is not anything that would compromise the safety of the home. Examples include: broken seal or cracked window pane, small leak in roof, incorrectly installed outlets that simply need to be reinstalled, hole in a wall, loose paver stones on a patio, loose trim work, carpeting that needs to be stretched, or a leaky seal on a toilet. These are issues in which there is a possible safety hazard. These include a bowing foundation wall, large leaks in roof, improperly installed electrical panel, cracked heat exchanger in the furnace, radon mitigation that might be needed, etc. Essentially, these are your items that may stop your transaction in its tracks. 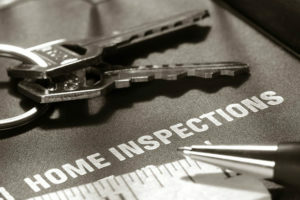 Home Sellers, keep in mind that inspections are not JUST for home buyers. Having an inspection might just help settle your nerves as you offer your home up for sale. Knowing that any potential issues have already been addressed. Should you get a home inspection before you activate your home in the MLS? If you are concerned that your home may have some surprises, it might be worth considering. When working with Nancy Miller, real estate broker with Coldwell Banker in La Grange, IL, you’ll find that this is amongst the many things that will be discussed in the process of listing your home for sale. According to the National Association of REALTORS Profile of Home Buyers and Sellers 2016 report, “only 6% (of buyers) purchased directly from a builder or builder’s agent.” With that few of people purchasing new homes from builders, it’s easy to see why Nancy Miller would want to make sure each and every client she represents would get a home inspection. Opinions can vary on whether to hire a licensed home inspector, or to have professionals in the trades (plumbers, electricians, roofers, etc) look at the various systems of the home. Whichever choice you make, it’s very important to have someone trained in these systems to inspect the property, both for accuracy of inspection and for your own protection. If you eyeball your inspection, and you miss something, you have no recourse or protection against anything that was missed. It is Nancy Miller’s professional real estate opinion that a home inspection is a necessary piece to the real estate process. With an average price of $200-500 in the La Grange, IL area (depending on size), it’s a minimal price to save thousands down the road.